10 ft. 1-inch, 30-inch x 54-inch Insulated Steel Attic Ladder with 350 lb. Capacity Type IA Rating Boasting a 350 lb. 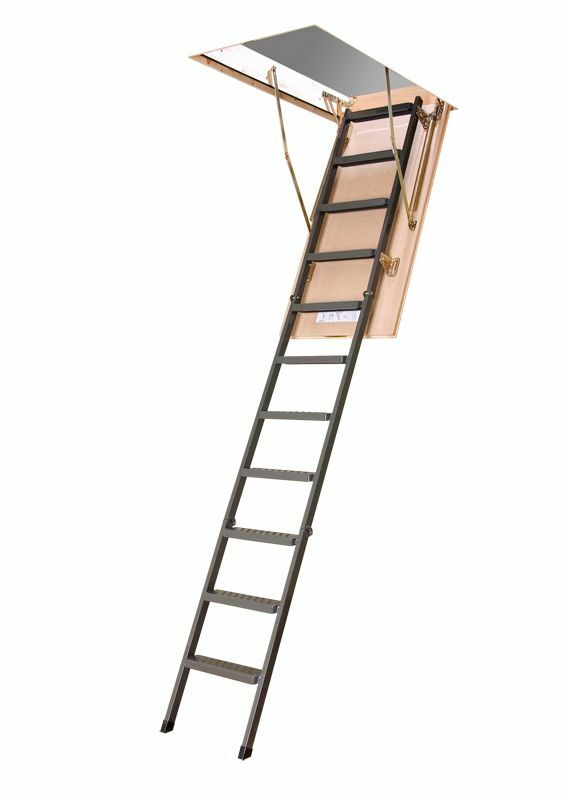 duty rating, this Fakro Insulated Steel Attic Ladder is designed for safety and comfort. Built from sturdy steel with a powder-painted finish, the ladder offers adjustability in door distance, length and spring tension to accommodate the needs of your space. Its ANSI-certified design features 12 steps with non-slip treads, while the insulation between boards offers efficient energy savings. 10 ft. 1-inch, 30-inch x 54-inch Insulated Steel Attic Ladder with 350 lb. Capacity Type IA Rating is rated 4.3 out of 5 by 50. Rated 4 out of 5 by Tipp from Strong and easy to install. Strong and easy to install. Rated 4 out of 5 by Audrey from The latch is not easy to close otherwise it’s a... The latch is not easy to close otherwise it’s a sturdy attic ladder. Rated 5 out of 5 by Jim from This product has met my expectations. No adjustments or modifications needed. Your store clerk wa... This product has met my expectations. No adjustments or modifications needed. Your store clerk was helpful in the selection. This type of service and assistance is what keeps me returning. Rated 5 out of 5 by Edward from Sturdy Very sturdy construction. Does weigh more than wood version so more care required to open and close. I removed metal ladder assembly first to make it easier to install the frame/door in the ceiling by myself. I used four L-brackets screwed to the inside of the frame to hold it in place while I leveled and attached to the ceiling. Otherwise you will require two people in the attic haul it up. Only issue was I added four 2.5" carriage bolts/washers to attach the metal ladder through the door, otherwise you could easily strip the mounting screws from the masonite panel. I also moved the lower attachment brackets to the lowest point on the door panel to prevent the lever/fulcrum effect that pulled out the top screws when I first climbed up. You'll need a metal sawzall to cut the bottom to fit for proper height/alignment. Rated 4 out of 5 by Nick from The ladder looks good. This ladder doesn’t have a... The ladder looks good. This ladder doesn’t have a pull string. You have to use a 3-4 ft key that is included to open and close the ladder. Also, the installation instructions looked way to complicated. I just used a couple 2X6s to rest the ladder on as I installed it. you can order online THD website or call the Company for direction how to order it.